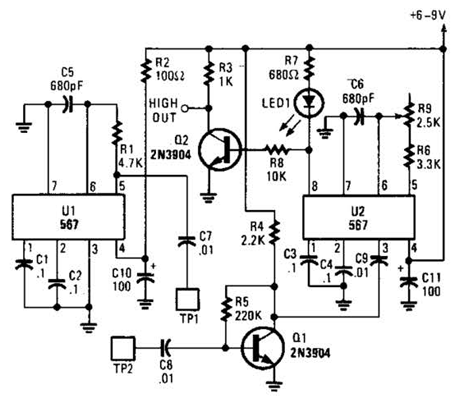 This is simple Electronic Circuit Diagram of Tone Burst Generator Circuit. Integrated circuit gates ICl-a and TCl-b form a monostable, whose time constant is determined by C2 and R3. When the transmitter is dekeyed (and then almost immediately rekeyed) point TX+ goes low and takes pin 1 low for a short time. This triggers the start of the timing period controlled by C2/R3. The capacitor C2, charges via R3 until the trigger point of gate ICl-b is reached. At this point, the monostable changes state and pin3 goes low again. On the prototype, this time was about 700 ms. The pulse occurs each time after dekeying and it is normally inaudible.